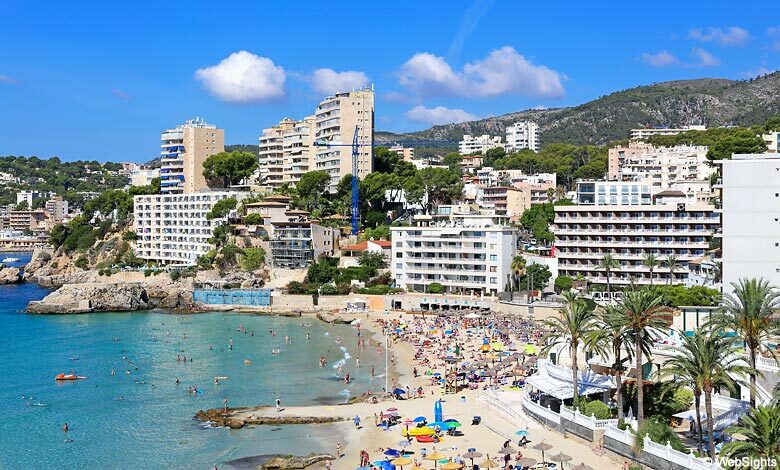 Cala Mayor, also called Cala Major, is located only a few kilometres west of Palma de Mallorca. From the airport, there are about 20 minutes by car. The lovely beach in Cala Mayor is a little more than 200 metres long and up to 80 metres wide. The beach is mainly surrounded by hotels, but there is also room for some high palm trees. The beach was improved and extended some years ago with fine-grained sand, which was shipped to Cala Mayor by boat. The water is clear, and high waves are a seldom sight. It is possible to rent sun lounges and sunshades at the beach and it has access to showers and toilets. Right next to the beach, there is a small supermarket where you can buy drinks etc., so you don’t have to carry a lot with you. 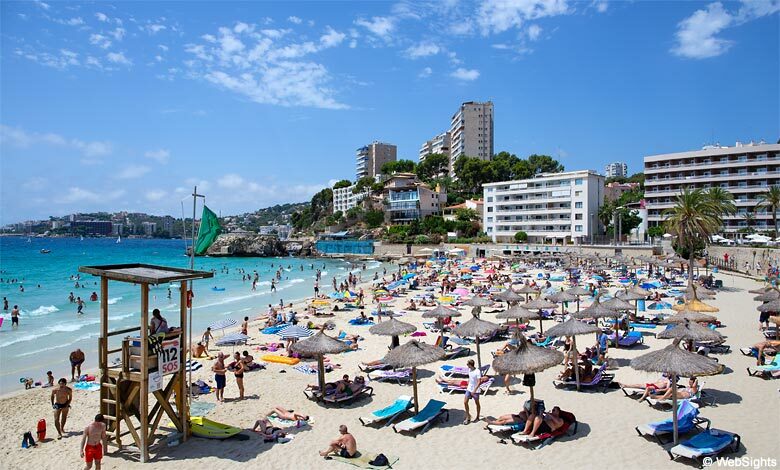 The beach is popular during the height of summer, particularly on Sundays when the Majorcans also go to the beach. On days like these, it may be difficult to find a parking space in the streets behind the beach. The beach is child-friendly. The water deepens slowly and annoying waves are rare. However, there is not much room to play during the height of summer. It is possible to rent water bikes, but apart from that there are no water sports activities. Behind the beach, there is a sea front with a fine selection of restaurants and beach bars. Cala Mayor is one of the oldest tourist areas in Mallorca, but during recent years, a lot of money has been invested in a renovation of the town and this is also for the benefit of its visitors. Along the main street Av. Joan Miró, there are many restaurants, bars and tourist shops. If you require a larger selection of restaurants and shops, Palma de Mallorca is not far away. Cala Mayor is known for the Marivent palace (Palacio Marivent), where the Spanish royal family often spend their holidays. However, the largest tourist attraction is the Joan Miró museum, where many of the works of Joan Miró are on display. The famous Spanish painter lived in Cala Mayor for the last 20 years of his life. The lovely beach is the central point of Cala Mayor. A bit to the southeast, you will find the Marivent palace that belongs to the royal family. Approx. 400 metres to the northeast is the Joan Miró museum. Further to the northeast, you will find Palma de Mallorca.